If you’d like to know more about Ghastly Affair, the Gothic Game of Romantic Horror, join me for a Q&A at Randomworlds Chat tomorrow (Tuesday, March 19th). starting at 7:30 PM CDT (8:30 EDT). I’ll be on until 9:30 CDT (10:30 EDT). See ya there! 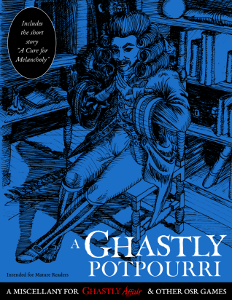 Ghastly Affair PDFs are Now 25% OFF for Christmas in July! 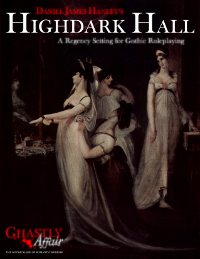 Now until the end of July, all Ghastly Affair PDFs are 25% OFF on DriveThruRPG and RPGNow. That includes the PDF versions of the “Ghastly Affair Player’s Manual”, “Ghastly Affair Presenter’s Manual”, and “A Ghastly Potpourri”, plus the Ghastly Affair novel “Hunter’s Song”! OSR blogger Ynas Midgard has just posted a new review of Ghastly Affair! The following random tables will help you set up properly desperate and dangerous relationships for the inhabitants of Grand Houses. Naturally, the possible results reflect the conventions of Gothic Romance and Romantic Horror. The tables can indicate that the persons’ love and hate are for the same person. I suggest keeping such results, and exploring the way that affection turns to violence, repressed desires breed madness, and a hatred nursed long enough can mutate into an irresistible sexual attraction. his (or his father’s) Mistress (and would marry her if he could). his wife (or intended wife, if unmarried). the Lady’s Maid of his wife, mother, or daughter. the romantic friend of a female household member. his wife’s (or mother’s) Modiste. the wife of an estate tenant. the wife of a grounds servant. a bandit who once robbed him. the Lady (or Lord) of the neighboring estate. a sibling, or other close relation. nobody, because his heart is still broken from a lost love. nobody, because he is incapable of it. a prostitute he often visits (other than his mistress). a well-known artist’s model, paintings of whom he collects. a singer, actress, or ballet dancer who is often invited to the house. an attractive new servant, who is actually an enemy spy or assassin. a member of the Royal Family. a Vampyre who visits him by night. a Succubus (knowingly, or unknowingly). the Estate Manager (always male in Britain, but may be a female Intendante in France). the Live-in, or Cavalier Servente of his wife (or mother). the Huntsman of the estate. He HATES and would destroy…. The rival for his love. his wife (or intended wife). a member of the local clergy. the lover of a family member. the master of the neighboring estate. a servant who has the favor of his wife (or mother). the bandit who once robbed him. nobody, because his heart is filled with kindness. nobody, because he is mired in apathy. a Player Character, on account of a supposed insult. the Live-in, or Cavalier Servente. her husband (or intended husband, if unmarried). an adopted foundling raised in the household. a bandit who once robbed her. the Lord (or Lady) of the neighboring estate. nobody, because her heart is still broken from a lost love. nobody, because she is incapable of it. a musician or opera singer who is often invited to the house. a handsome new servant, who is actually an enemy spy or assassin. a Vampyre who visits her by night. the political enemy of her husband (or father). the live-in Mistress of her husband (or father). her Lady’s Maid (or the Lady’s Maid of another household member). her Modiste (or her mother’s Modiste). She HATES and would destroy…. the rival for her love. the artist who made her look ugly in a portrait. the mistress of the neighboring estate. a servant who has the favor of her husband (or father). her husband (or father’s) political rival. the man who once assaulted her. the bandit who robbed her. nobody, because her heart is filled with kindness. nobody, because she is mired in apathy. pursue a relationship, seemingly heedless of the possible consequences. run away with their beloved (if the feelings are reciprocal), or else abduct and imprison their beloved (if the love is not reciprocal). promote their beloved’s interests in every way. speak and act impressively, whenever the beloved is watching. avoid the pain, by separating themselves from their beloved. kill their beloved, so no one else can ever have them. use magic to make their relationship possible. stoically keep their feelings to themselves. framing the enemy for a crime. slandering the enemy with false accusations. enlisting the aid of a supernatural being. bringing down a supernatural curse. seducing and ruining someone the enemy loves. alienating the enemy from their friends and family. stoically controlling their own anger. 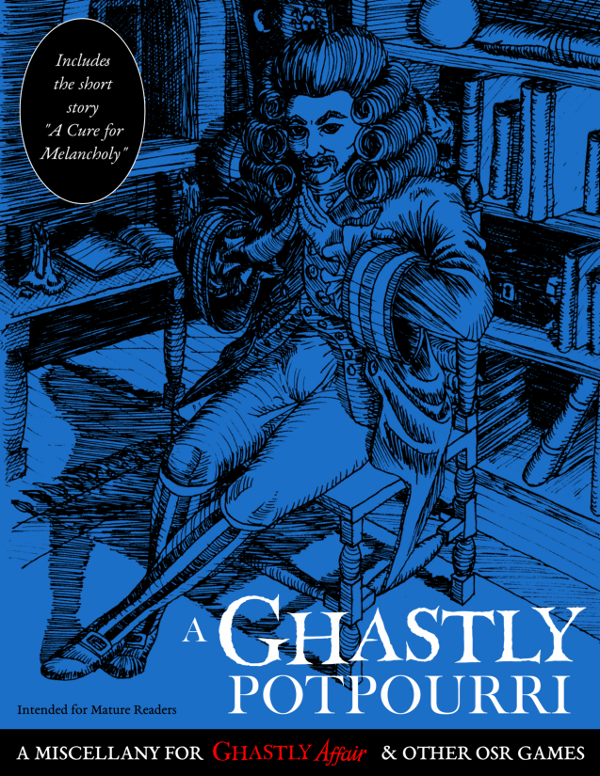 A Ghastly Potpourri – Now Available on RPGNow and DriveThruRPG! GMs and players of any game set in the late Georgian, Regency, French Revolutionary, and Napoleonic eras will also find much of interest, as will anyone gaming in the Horror, Dark Fantasy, Weird Fantasy, Dreadpunk, Mannerpunk, Steampunk, or Austen-punk genres. The Incarnations of Spiritual Powers, from Kubla Khan who dwells in Xanadu, to The Queen of the Night! Plus, an Original Short Story by the author of the Ghastly Affair novel “Hunter’s Song”! Available in PDF and softcover print. Get yours today on RPGNow and DriveThruRPG! New Preternatural Effects and Weird Objects. 33% OFF the Ghastly Affair Presenter’s Manual PDF for GM’s Day! The Illustrated PDF Version of the Ghastly Affair Presenter’s Manual is now 33% OFF on RPGNow and DriveThruRpg, as part of their GM’s Day celebration! Even if you don’t play Ghastly Affair, the Ghastly Affair Presenter’s Manual is filled with resources for running better Gothic, Horror, Georgian-era, Napoleonic, Regency, Austen-inspired, Mannerpunk, and Dreadpunk games. Besides extensive notes on the themes and motifs of Gothic and Romantic fiction, and clear advice on creating and running game sessions, it includes a year-by-year chronology of events in Europe between 1765 and 1820 – with an emphasis on the strange, the shocking, and the scandalous. I’ve previously posted about my plans for a supplement updating Ghastly Affair for the Swinging Sixties and Groovy Seventies. The following are the new Classes I’m considering for GROOVY Ghastly Affair. None of them are playtested yet, of course, so a lot is likely to change as the supplement evolves. The Biker is something of a replacement for the Gypsy, filling the role of the abjected outsider. They would also be strong in combat, like the Bandit. I could see an entire Saga where all the PCs are Bikers traveling the roads, battling both The Man, and supernatural evil. Advances as a Fighter in other OSR games. The Player would choose whether their Investigator is a Police Detective (inspired by characters like Columbo and Kojak), Private Eye (inspired by characters such as John Shaft and Charlie’s Angels), or Investigative Journalist (inspired by characters like Carl Kolchak). Undercover vigilantes inspired by characters like Foxy Brown or Coffy could also be represented by this Class. Special Abilities: Danger Bonus (+1), Detect Lies (+1), Disguise (+1), Sneak (+1). Police Detectives can call in Police Backup, Private Eyes gain 1 Private Informant per Level, and Investigative Journalists are skilled in Investigative Research. Damage Bonus Increases: Every Level after 1st. Advances as a Cleric if used with other OSR rules. Basically an update of the Bandit Class. Probably needs more work to really emulate the literary/cinematic Gangsters of the late 20th century. Advances as a Thief if used with other OSR rules. Inspired by historical figures such as Charles Baudelaire and Arthur Rimbaud, and characters like Sam Evans from “Dark Shadows”. This would also work for regular Ghastly Affair. Inspired by characters such as Roger Collins (from “Dark Shadows”), Gomez Addams, and Johnny Alucard (from “Dracula 1972 AD”). Replaces the Libertine, which (as written) is more suited to the 18th century than the 20th. The ubiquitous psychic researcher of late 60s /early 70s horror. Inspired by characters such as Dr. John Markway ( “The Haunting”), Dr. Lionel Barrett (“The Legend of Hell House”), and Dr. Peter Guthrie (“Dark Shadows”). Another Class that would also work well for regular Ghastly Affair, as the “Seer”. Inspired in the modern age by characters such as Florence Tanner (“The Legend of Hell House”), Ben Fischer (“The Legend of Hell House”), Theodora (“The Haunting”), and David Collins (“Dark Shadows”). Special Abilities: Choose (or randomly determine) five Psychic Powers. To use a Psychic Power, make a Wisdom Check with a Penalty equal to the Power’s Level. If successful, the User also suffers Nonlethal Damage equal to the Power’s Level. If the Check is failed, the Power can still be activated, but inflicts Lethal Hit Point damage equal to the Power’s Level. Advances as a Magic User / Wizard if used with other OSR rules. One of the Psychic’s Powers is..
As for the existing Classes, Demon Hunter, Everyman, Magician, and Mad Scientist would be used unchanged. The True Innocent of the Swinging Sixties and Groovy Seventies would no longer have the “Fainting” Weakness. It would be replaced with something like “Honest to a Fault”, indicating that the Innocent is a very bad liar, who shakes and stammers when they try to deceive. Even when they do lie successfully, the truth always comes out. The big inspiration here is Victoria Winters from “Dark Shadows”, of course. The Bandit, Grave Robber, Gypsy and Libertine Classes are perhaps more suited for games set in the late 18th / early 19th century. However, since the intrusion of the past into the present is major thematic hallmark of the Gothic, characters seemingly (or even actually) from another time might indeed be present in the “modern” world of GROOVY Ghastly Affair.